Happy first day of September and the start of the Labour Day Weekend! To celebrate the last unofficial weekend of the summer, I’m sharing a deliciously simple recipe for Maple Walnut Crunch Granola. 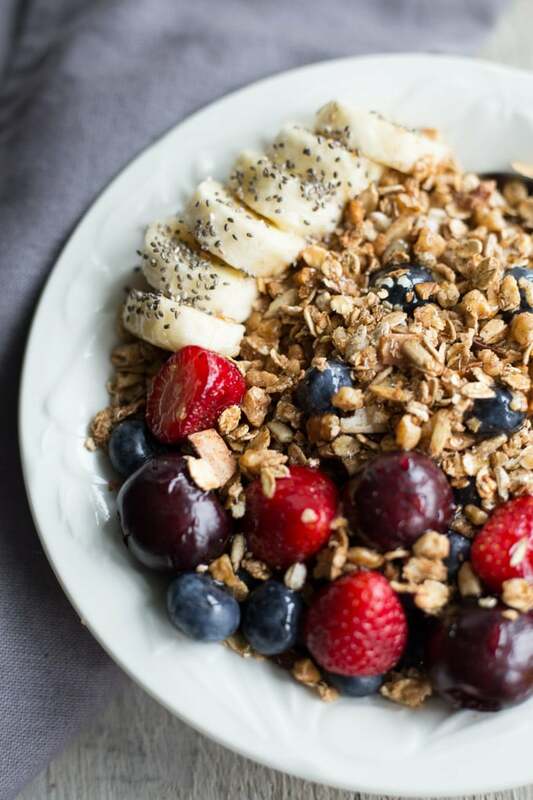 This weekend is all about relaxing and easing back into a routine, and there’s no better way to do that than with easy, comforting, hearty granola! It’s perfect for back to school meal prepping or your long weekend road tripping/camping plans. 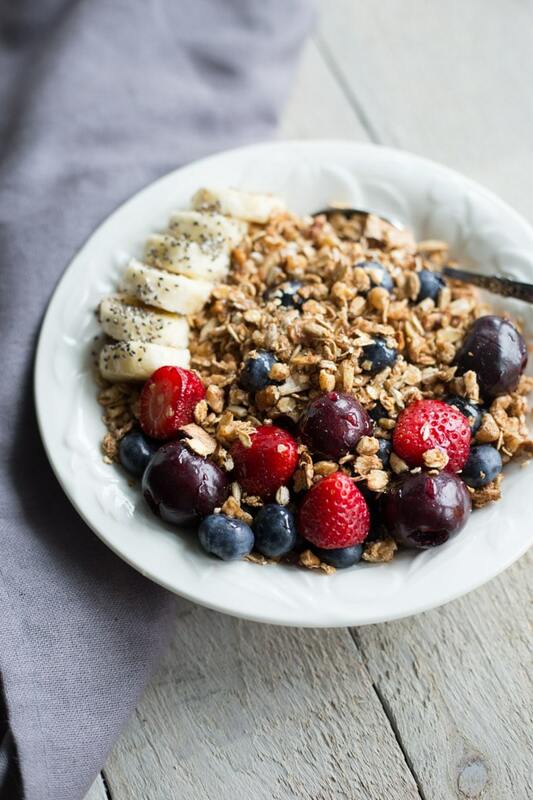 Just throw this granola in a container or resealable bag, and you have yourself a convenient breakfast or snack! Can I say how much I love September and all things fall? I know it might be a little early, but my house already smells like a mixture of cinnamon, apple, maple and pumpkin spice. That’s mostly because I’ve been granola obsessed lately and trying all sorts of seed, nut, oat and spice combos! We are pretty much on granola overload in our house right now! My favourite so far has been this Maple Walnut Crunch Granola. It’s sweetened with just maple syrup and maple flakes and doesn’t contain any oil or butter. The ingredients form into crunchy clusters all from the maple syrup! It’s perfect for topping yogurt, smoothie bowls, and even muffins. 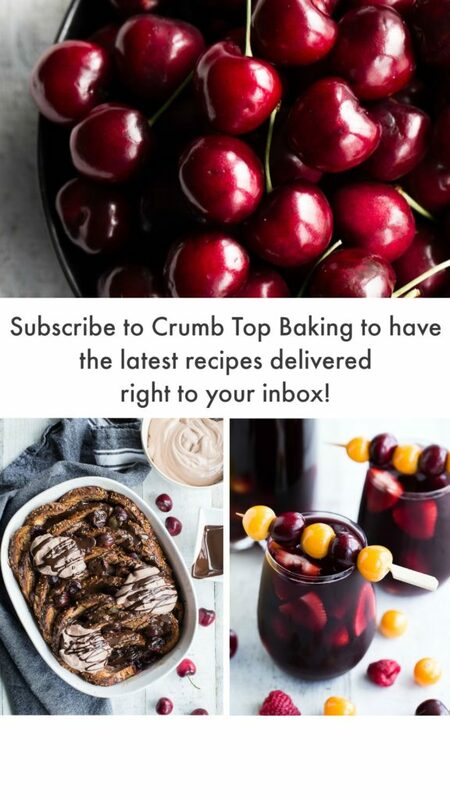 (I love using granola as a topping in muffin recipes!) But mostly I’ve just been eating this granola by the bowl full (not even as a topping) with cashew milk, fruit and a drizzle of honey. YUM! I polished off the bowl of granola pictured here in this post the moment I finished taking photos. The granola had absorbed all the cashew milk by that point, but it was still delicious! You know, the kind of delicious you enjoyed as a child when your sugary cereal got a little soggy and it turned the milk super sweet? Like that, except clean eating sweet from the maple syrup. Don’t judge! You know that brings back fond memories of eating Frosted Flakes or Cap’n Crunch 😉 . If you follow any of my Instagram stories, you’ve been seeing some of my granola and granola bar experiments lately. I gotta say, you really can’t go wrong with granola based recipes. They are hearty, healthy and totally versatile. You can add a variety of nuts, seeds, grains, spices and dried fruit, and make it grain-free or nut-free, depending on your preference. I love recipes with flexibility! This Maple Walnut Crunch Granola is hearty, crunchy goodness that is perfect for back to school meal prepping or your long weekend road tripping! It only uses maple syrup and maple flakes as a sweetener and doesn’t contain any oil or butter. Just lots of oats, nuts and seeds! 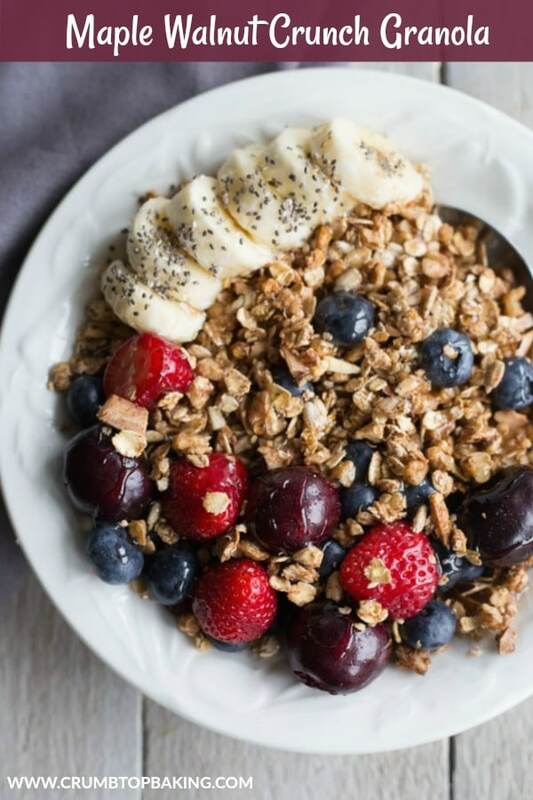 Throw this granola in a container or re-sealable bag for a convenient breakfast or snack on-the-go. Pre-heat the oven to 375 degrees and line a large baking sheet with parchment paper. 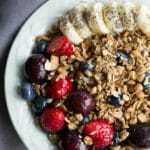 In a large bowl, add the oats, walnuts, quinoa flakes, coconut chips, almonds, sunflower seeds, 3 tbsp maple syrup (reserve one tbsp), maple flakes and cinnamon. Stir until well combined. Spread the granola mixture out on the baking sheet and drizzle the remaining tbsp of maple syrup over the top. Place in the oven and bake for 15-18 minutes, stirring a few times to ensure it doesn’t brown too much. (See note). 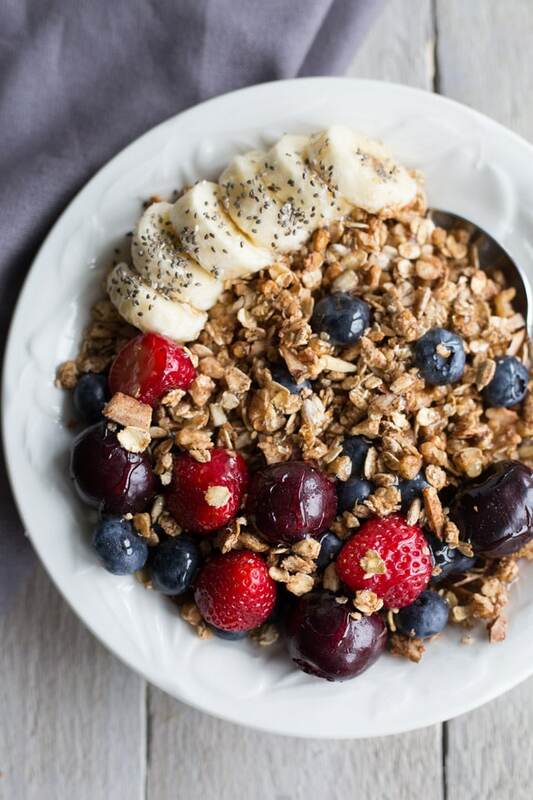 Let the granola fully cool on the pan for 1-2 hours. It will get crunchier as it cools. Once cooled, store in an airtight container or re-sealable bag on the counter. I found organic maple flakes at Bulk Barn. If you like your granola with a few little clumps and clusters, the key is not to over-stir while it is baking. Just gently stir the granola a few times while it bakes to ensure it doesn’t brown too much on one side. If you stir too vigorously, some of the little clusters may break apart. 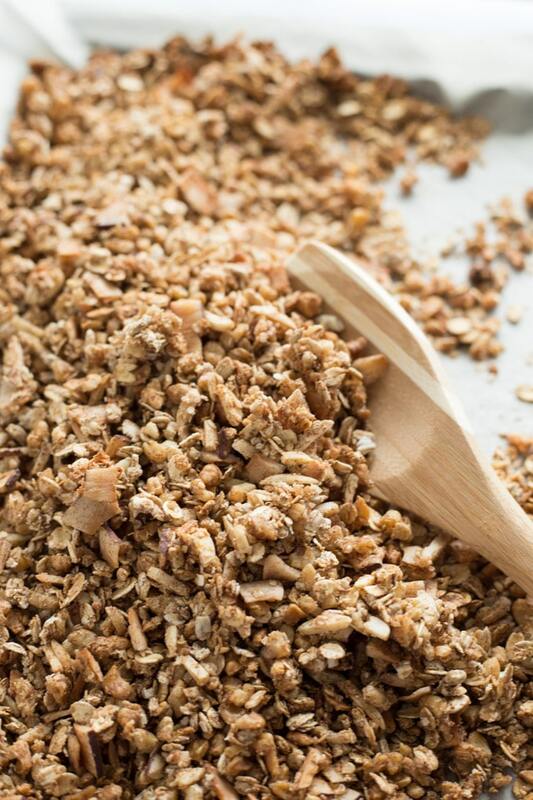 But if you enjoy more crumbly granola, stir away!